When I first heard about this book, which was released September 7, 2010 (by Sterling Publishing), I thought it would help me and provide tips on parenting and educating my toddler Brandon. It was quite a thick book packed with tips and all the information that I need to know. The topics that most interests me is about behaviour throughout the book. Brandon is great with many things (such as eating, communicating, learning to share, etc), except that he whines a lot if he doesn't get what he wants. As a first time mom, I'm always asking for tips and advice. Dr. Jenn Berman had a book signing in LA between September 13 and 16. I wish I was there for her autograph and to actually meet her in person. The first three years of life are the most important for nurturing a child's full potential: that's when they start forming attachments, developing a sense of self, and learning to trust. During this time, there are critical windows of opportunity that parents can take advantage of-if they know how. 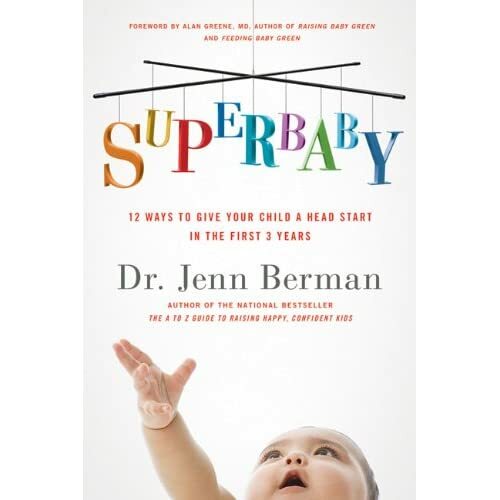 In a dozen succinct yet information-packed chapters, award-winning columnist and professional therapist Dr. Jenn Berman gives parents the knowledge they need. Her enlightening sidebars, bulleted lists, and concrete, easy-to-use strategies will help parents raise happy, healthy babies…who grow to be flourishing toddlers and successful adults. Dr. Jenn Berman points out all the critical windows of opportunity you need to know, explaining how to take advantage of them for your child's optimal mental and emotional growth. Following her suggestions will be fun for the whole family and create a stronger bond between you and your baby. Dr. Jenn Berman, a marriage, family and child therapist in private practice, is a regular on The Today Show and The Early Show; she has also appeared on Oprah, The Tyra Banks Show and hundreds of others. Her award-winning "Dr. Jenn" parenting column has been published for over eight years by Los Angeles Family magazine and four others. You can follow Dr. Jenn Berman on TWITTER and on FACEBOOK. Great Book and it is easy to read!Fantastic tips for Baby Shower!